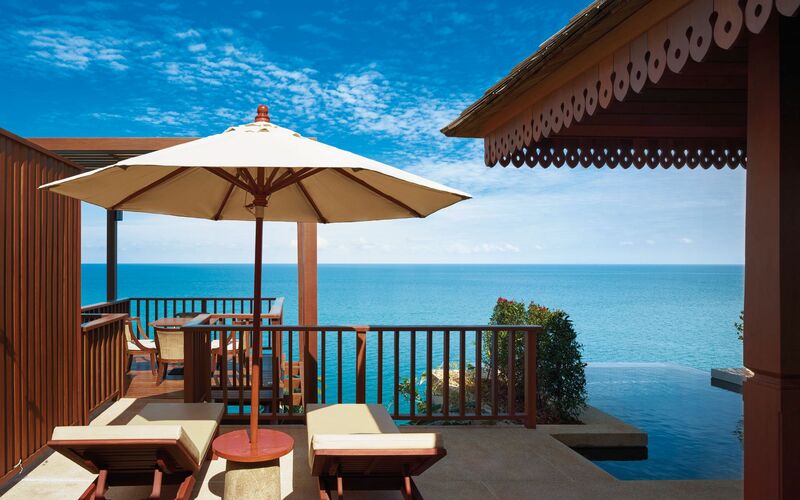 Yoga overlooking the Gulf of Thailand, breathtaking ocean views from your private villa poolside and industry-leading standards of hospitality: here’s why a stay at The Ritz-Carlton, Koh Samui will leave you marvelling at the island’s idyllic beauty long after you’ve left on your plane back home. The Ritz-Carlton, Koh Samui spans from hilltop to beach, a luxurious oceanfront resort that sits on a former coconut plantation. The first Ritz-Carlton hotel in Thailand, the resort's use of coconut and other natural elements across 175 lavish suites and pool villas blends well with the beauty of its surroundings. With its stately bedroom, luxurious en suite bathroom with 2 vanities and a neat little day-bed out on the terrace, the Terrace Suite has all the trappings of a cozy couple's hideaway. The stylish contemporary interiors of the Terrace Suite are not without ubiquitous traces of local architecture and neutral colour tones. The suite offers views of landscaped gardens and other lush greenery surrounding the resort in addition to small snippets of the ocean. If you're after uninterrupted views of the Gulf of Thailand, there’s always The Ocean View Pool Villa or the Ultimate Pool Villa which boast a well-appointed separate living area and outdoor swimming pool. Unsurprisingly, there are many spots around The Ritz-Carlton, Koh Samui from which guests can enjoy sweeping views of hillside greenery and the peaceful ocean in one breath. Sala Thai is one such place; the resort offers sunrise yoga sessions here. As a rule: wear your comfiest shoes and be prepared for lots of walking over the resort’s extensive grounds. You’ll always have the option to get from your suite or villa on one side of the resort to Sala Tai and other areas via a quick buggy ride if you don’t mind the waiting time. Besides yoga, guests can catch the adrenaline rush of Muay Thai sessions at the Muay Thai ring at THB 2,500++ per person or opt for more laid-back beach activities like stand-up paddle boarding or kayaking with a trained guide. For a leisurely evening game of tennis, hit the resort’s two floodlit tennis courts while the kids have their share of outdoor and indoor excitement in designated play areas under the Ritz Kids programme from 9am to 5pm daily. More than 50 fascinating species of fish enjoy their own brand of five-star treatment at the resort’s one-of-a-kind temperate Swim Reef. Don't believe me? Ask the resident snorkelling instructor who's ever ready to share eye-opening stories about the island's unique marine life. At this shallow reef are snorkelling and fish-feeding activities available from THB 500 per person. Of course, if your definition of ‘laid-back’ necessitates a spa treatment or two, make your way to Spa Village Koh Samui, an awe-inspiring spa area that includes 8 treatment suites, 3 massage pavilions, a yoga area and a lap pool with its own set of luxurious cabanas. Bookings here tend to fill up quickly, so reserve your appointment in advance to enjoy pampering coconut scrubs, 'Songkran showers', flower-infused massages and more for approximately THB 5,500 per treatment. The delights of Thai cuisine are yours to discover in a variety of settings at The Ritz-Carlton, Samui. A personal favourite of mine would be Shook!, a buffet-style paradise that will undoubtedly shake up the regular breakfast routine. For more serene seaside ambience, however, try more intimate spots like the Sea Salt Deck overlooking the beach or the One Rai bar and lounge for even better panoramic views. Although The Ranch at The Ritz-Carlton, Koh Samui is the place to go for all the American steakhouse classics, the Western fare at the Sea Salt Deck is truly exceptional. Visit this breezy beachside restaurant on Sunday and Monday evenings to enjoy a special dinner of fresh seafood and prime meats grilled on the spot. Saturday nights are best spent at Baan Talat, an outdoor dining area abuzz with Thai ‘street food’ stalls, tables selling local handicrafts and traditional dance performances that reflect the atmosphere of a bustling Thai marketplace.